Birthday present ideas with No-Risk Guarantee! Your unique birthday present ideas problem solved - possibly forever! "They laughed when I said I'd been given a 'Masterpiece' for my birthday - and then I pointed to the wall..."
"I couldn't believe it...my Monet reproduction looks just like the real thing! Thank you once again...I'll definitely be recommending you to all of my friends and business acquaintances." If you're anything like me, at least a couple of times a year, birthday present ideas are a big problem - there's always someone who you just can't think what to buy for their birthday. Isn't it difficult to find something original? Perhaps it's for your husband or wife, boyfriend or girlfriend, nephew or niece...it may even be your parents or grandparents. They may be very fortunate and just seem to have everything they need, or perhaps you just want to make this year extra special. You just can't think of, or find anything totally unique and original that tells that special someone that you care - you've taken the time to find them something exclusive that you probably haven't seen before.. If you've been racking your brains trying to think of unusual birthday present ideas with real quality, now it's easy to get that exclusive, unique gift you've been searching for - right here, right now, on this very web site. "I received the painting of David Meade today and I have to tell you a whole minute of silence went by as my daughters and I gazed at the work of art in awe. I actually felt tears of joy coming up in my eyes. We are so pleased. Thank you. In the Spring, I will be asking you for another painting I would like to have done. Thank the artist who did this work for me. I am simply in love with it." Now you have discovered the solution! OK Phil, I hear you say, I've seen oil paintings before - what makes yours so special? Limited edition prints of an original artwork. Numbered prints that try to make a virtue out of the fact that 9,999 other people have something that is exactly the same as your 'work of art'. Prints of a bland countryside scene by an artist that few people have ever heard of. Lying on a shelf somewhere waiting to be...'shipped to you within 24 hours!'. This may be convenient, but exclusive...? Hardly! Produced using automated methods of any kind. Of 'average', 'satisfactory' or 'commercial' quality - these are terms that are used to describe the paintings of less skilful artists. 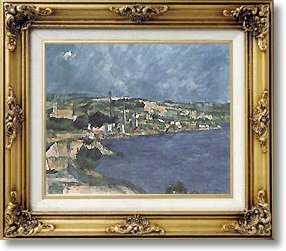 Posters - there are numerous web sites that sell posters on the internet (our last check on the search engine 'Google' revealed more than 9,000,000), but we specialise only in the finest quality hand-painted oil paintings. Buy 1, get 1 free! Whilst we arrange discounts for existing customers and on multiple orders, this reflects the value we place on your custom, not the lack of value that we place on your oil painting(s). "Your company was recommended to me by a relative and I'm so glad it was......the 'Saint Henri et La Bale de L'Estaque' by Paul Cezanne that I have received today is excellent in every detail...you have restored my faith in real customer service...rest assured that I'll have no hesitation in recommending you to all my friends in the same way that you were recommended to me in the first place." OK, that's what they're not, so what is so special about them? Prized possessions that make beautiful, original gifts for loved ones, family, friends or business colleagues. Unique - each oil painting is individually hand-painted by an expert in their field. Exclusive - your work of art is created specifically for you, directly and solely as the result of your personal order. Created by experienced, specialised artists who are masters of their craft. Created using the finest quality vibrant oils - a method that has stood the test of time and has resulted in countless masterpieces that have lasted for centuries. An education - they introduce children and adults alike to the very real beauty of art, particularly with our authentic reproductions of 'Old Masters' famous paintings. Painted onto fine quality European linen canvas. Created with care - each oil painting takes between 8-10 weeks from the time you order to the time of dispatch. You will discover that the resulting work of art is well worth the wait! Superb quality - but don't just take my word for it, click here to prove this for yourself by reading some of the testimonials from our highly-valued customers. Shipped free to wherever you (or the person your gift is for) may be, anywhere in the world, rolled in a strong cardboard tube for secure protection in transit. Affordable - prices start at £95 (around US$160) and you can pay securely online using your credit card in pounds (£), US$ or Euros, or by cheque or money order if you prefer. We don't have the overheads of an art gallery in a high street or shopping mall, so you pay wholesale prices for truly exceptional quality. Backed by our 100% Better-Than-Risk-Free Guarantee - more about that in a minute. "I would like to thank you once again for the painting, as I was able to give my sister such a lovely present. I will let you in to a secret; she cried when she saw it as it was just so like Jess (..her pet cat). I know she has shown it to all our family and many friends who have all said how wonderful it is and I am sure we will be using your company again in the not too distant future! Just imagine your special someone's face when they see that you've found them something so personal, so unique, and so exclusive... Even if you hadn't planned to spend quite as much, won't that be worth a little extra? One of our specialist team of highly-trained, experienced artists will create the finest quality, exclusive, hand-painted oil painting from your own photograph, or create an authentic reproduction (..right down to the pattern of brush-strokes!) of any 'Old Master' oil painting you desire. That's all very well, but what if you don't know which oil painting your special someone would really like? If you are not sure which photograph they would like transformed into their very own work of art, or which 'Old Master' reproduction they would really like, we can solve your problem. You can buy them a Filman Fine Art Gift Voucher here and let them choose for themselves! This makes a perfect gift for anyone. They can select their own favourite photograph to have transformed into their very own 'masterpiece', or decide which 'Old Master' reproduction they desire, in their own time, at their own pace. This is also a very useful option if the birthday is quite soon and there isn't enough time to create your oil painting. "I'm sorry that I haven't been in touch earlier, but I've just returned from holiday and found your excellent painting waiting for me. The quality has excelled my expectations, the reproduction of the instruments is accurate and you have taken 10 years off our ages! I enclose a cheque for...and thank you once again for your fine professional service." Are we the cheapest on the internet? I won't make any attempt to mislead you here, so probably not. But beautiful oil paintings that can retain their vibrant appearance for generations to come, are not only about the price. You'll obviously want the details of your oil painting to be just right - so do I. We're in this for the long haul, so satisfied customers are the only kind I ever want. In fact, I'm not happy unless our customers feel we've over-delivered. This means we use only the finest artists and they use only the finest materials. I know you'll understand that this means we could produce cheaper oil paintings, if we are prepared to compromise on quality. But we're not. Period! So, cheaper elsewhere - possibly. Better quality, personal old-fashioned service and value-for-money -- I don't think so! If you're anything like me, you'll feel that this is more important. In fact, I do know of another oil paintings web site (mentioning no names), that produces high quality oil paintings such as ours. But their prices are up to 3 times higher than ours! And if you go to your nearest art gallery and purchase an 'Old Master' reproduction of equivalent quality, it could cost you thousands, rather than the hundred(s) you'll pay on our web site. What about our 'Oil Paintings from Photographs'? If you want an oil painting created of a particular subject (e.g. a beautiful, unique family portrait or pet portrait etc. ), the only alternative to our 'Oil Paintings from Photographs' service is attending an artist's studio (umpteen times!). And paying them thousands for an oil painting that we will create for hundred(s). Click here for price guide. And, even if you wanted to spend that much, it isn't any use if you wanted your birthday present ideas to be a surprise, or the subject of your oil painting isn't able to attend countless (and tedious) sittings at an artist's studio. All of our oil paintings are created entirely by hand by very experienced artists, without automation of any kind, individually just for you. An oil painting makes a very special, unique gift...and just imagine the joy of receiving a fine oil painting of loved ones. A priceless gift to cherish forever! Free Bonus #1 Automatic entry to our "Privileged Visitors List": receive an ongoing series of personal discounts and special offers. Free Bonus #2 15% Referral Commission: recommend us to a friend, family member or business colleague, and you will receive 15% of the retail price of their oil painting, or 20% off the price of the next oil painting you order from us, whichever you prefer. Value - £106 ($170*) Minimum cash bonus for only 5 referrals. Value - £70 ($112*) Minimum saving for only 5 oil paintings. Free Bonus #4 Photograph 'Archive Service': whenever you use our 'Oil Paintings from Photographs' service, we will scan your photograph into our computers and retain it on file for a full year. Our system is backed up daily, so if your original photograph and/or the oil painting that we have created from it get damaged in any way, we can easily provide a replacement for you, with the minimum of fuss, inconvenience or delay. Free Bonus #5 Web site e-book: the whole of our oil paintings web site in downloadable 'PDF' format (Windows or Mac). You can read anything you want at your leisure, without the expense and/or sometimes the inconvenience, of being connected to the internet. Value - £9.95 ($16*) Depending on the cost of your online connection. * $US amounts are approximate and depend on the exchange rate. These free bonuses are being used for market research - you will not find them listed on any other page of our web site, and one, some or all of them may be withdrawn at any time. Order NOW and lock in all these bonuses worth £499.95 ($801)! If you are not delighted with your unique oil painting for any reason, just send it back within 365 days (yes, it's not a misprint, that's a whole year! ), for a no-hassle, no-questions-asked full refund! And you even get to keep the relevant free bonuses, so this truly is a risk-free purchase! Order your beautiful oil painting and then decide if you like it enough to keep. Just try to find a guarantee like this on any other oil paintings web site or from any art gallery or dealer! How can we afford to make this unequalled, better-than-risk-free guarantee? I just know that you'll love the beautiful, exclusive work of art we'll create for you. And that special someone you've ordered it for won't believe what you've managed to find for them (just imagine their face when they see it!). I believe we should take all of the risk, leaving our customers with absolutely none. Order one of the oil paintings in our 'Online Galleries', and you will benefit from our lowest list prices. These are our most popular artworks, which means that our specialist artists are very familiar with them - they take them less time to paint and, as you know, time is money! Use the following links to visit the Online Gallery of your choice, with secure online payment facilities and open 24/7, 365 days a year! Remember - in our online galleries, you will only see a sample selection of the thousands of 'Old Masters' oil paintings that our team of specialist artists can authentically re-create. If the oil painting you desire is not in our galleries, or you want to use our popular 'oil painting(s) from your own photograph(s)' service, please follow the simple 3-step ordering instructions below. You will receive a quote by return email. If you are ordering an oil painting from your own photograph, we will confirm the price as soon as we have seen your photograph. Pay online with our secure, state-of-the-art credit/debit card facilities in pounds (£), US$ or Euros, or send us a sterling cheque/money order if you prefer. P.S. Your exclusive oil painting comes with our 'Better-Than-Risk-Free Guarantee' and free delivery worldwide. The free bonuses above, worth £499.95 ($801), are a marketing trial, so order NOW to lock-in your bonuses. Please don't wait and be disappointed!